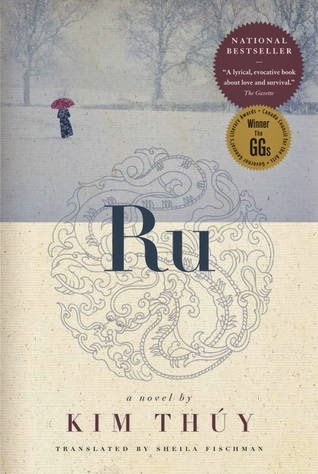 Ru is a memoir about of a Vietnamese refugee who has escaped the war torn Vietnam with her family. Although this is a fictional autobiography, the events described in the book feel so real, so personal. You can't help but feel that many of these accounts are based on Kim Thúy's personal experiences. Each page in the book is a vignette, a memory that takes us from the young girl's extravagant life in Saigon, to a decrepit refugee camp in Malaysia and finally to a new unfamiliar world in Granby, Quebec. We also get a glimpse into her adult life where she has a family of her own raising two children, one of whom we are lead to believe is autistic bringing forward the challenges of motherhood and the realization of what love really is. Ru is beautifully written, almost lyrical. It puts the hardships of Vietnamese immigrants front and centre. We also get a sense of how communities in Canada, specifically Quebec, banded together to sponsor and support them as they transitioned into this new world. This is the first of the CBC Canada Reads finalist books that I have read. The debate to determine the winner is on March 16. Have you read any of them? Who do you think will win? Let me know in the comments below.